This 26 page Double Under Training Manual will guide you in 5 Basic Steps to the accomplishment of 50 consecutive Double Unders Unbroken. You may say how is that possible if I can do only one or two. 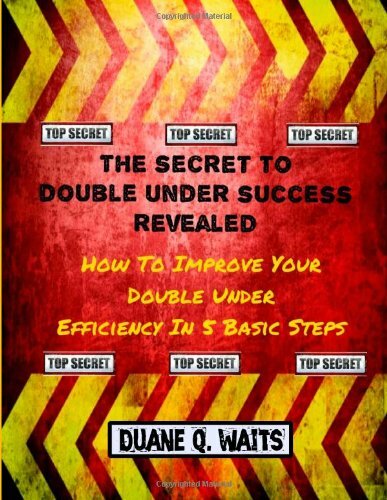 It is possible because I have put together a road map that will guide you down the road to double under success.People struggle because they don’t have the proper instruction / coaching to get them to the next level; Until Now!Don’t take my word for it, check it out for yourself and sign-up to get Three FREE Chapters Today! Do You Want More RESULTS for Your Time and Effort? Do You Want More RESULTS for Your Money? Have You CrossFitted for More Than 1 Year Continuing to Avoid Double Unders Opting For Hundreds of Singles? Are You a Coach, who is Frustrated and Can Not Break Through and Help Your Athletes Reach Their Double Under Goals? Are you Fed-Up with Mediocre Training Videos and Blog Post that only give you one option to reach your goals? Finally, are You Ready To be Understood, Once and For All, and Have All Your Double Under Training Tailored to Your Specific Needs and Abilities? If You Answered Yes to One or More of The Above Questions, Then NEXT LEVEL – Get To 50 – Double Under Training is for You. This Training Program Comes With A 100% “No Questions Asked” Iron Clad, 90 Day Money Back Guarantee! This NEXT LEVEL Training Program Is Available For A Limited Time Only! In the CrossFit Community we all have see it. Athletes struggling to conquer the mighty Double Under. For most, the Double Under is Mt. Everest and even on the calmest day they are unable and many unwilling to take that hike up the mountain because they have tried so many times and failed. The funny thing is failure is good because it leaves a path of clues to success. We as successful athletes must discover those clues, make adjustments and move closer and closer to are goals. The jump rope is a simple extension of our bodies, with proper training and time mastery is inevitable. Just like learning to roller skate, drive a car, or even bowl we must take advantage of our innate ability to adapt and overcome. Avoiding the inevitable is showing your fear and giving power to a scenario that should be easily overcome by capable and accomplished adults. Why do so many give up on Double Unders and stick with Single Unders? The simple answer is, ignorance of their own skill and abilities, and not having a specific training direction/path to overcome their short falls and smoothly adjust in a progressive fashion until ultimate success. What Specific issue do you struggle with most? “I have improved greatly since starting CrossFit back in March, 2011. You taught me to control the rope and not let the rope control me. Once I was able to control my speed and was able to go slow and or fast doing singles, I was then able to do a few singles and work in one double under. My rhythm is good enough now to where I can do 4 to 5 double unders, which I still need to work on. One key element that helped me the most was to use my wrist and not my arms so much. Thanks. “Duane coached me as I was struggling to learn double under’s. He noticed that when I jumped-rope, I would jump extremely high and pointed out that this causes me to do extra work, which would make me get tired more quickly, and therefore decrease my amount of reps that I was attempting to jump for.Another thing he pointed out is to keep my hands near my waist and rotate at the wrists. This allows me to control the rope better. He taught me that jumping at a shorter height, but keeping control of the rope better, as I swing it a little faster will enable me to not get tired so quickly, and can therefore do more reps.One thing I like about Duane’s coaching is that he shows you how to perform your own technique that best fits an individual’s learning style which allows each person to learn to the best of their ability. The most efficient Double Under Form I have seen on the Internet. Efficiency Is the key to your success as well. As with all things you must believe you have or can do something in-order to accomplish anything. Get your conscience mind out of the way and let your body do what comes naturally. I’m interested in virtual training for double unders. I look forward to hearing from you. Hey Jim have you looked at the training packages available on the site? Double Unders and The 2015 CrossFit Games Are You Ready! Double Under Jump Rope Length; Is Your Jump Rope To Long or To Short?